From left to right, CFUW Owen Sound members Ruth Henderson, Judy Beth Armstrong and Jean Milburn. It all began as a brain-wave of our long-time member, Judy Thomson, who in the summer of 2015, hand-picked a few members of our group to form the Dickens Project Planning Committee. The idea was that since CBC Radio personalities had successfully presented dramatic readings of A Christmas Carol across Canada (including Owen Sound) for many years and the script was there in the public domain on the CBC website, we should organize a reading as a fund-raiser for our Owen Sound club. But we wouldn’t use CBC radio personalities; we would enter into a co-production agreement with The Historic Roxy Theatre and its very talented, award-winning members of Owen Sound Little Theatre (OSLT). And we did! For the first two years – 2015 and 2016 – experienced OSLT Director Michael Rea with his wife/CFUW member Elizabeth Rea (as Coordinator/Stage Manager) auditioned, cast and rehearsed the readers, all mainly members of OSLT. They also secured an enthusiastic choir director who convinced nine brilliant singers to perform six traditional carols, one between each Stave. 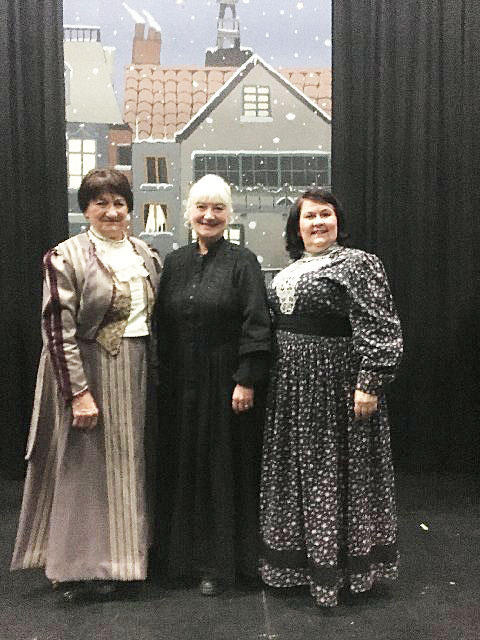 Our Dickens Project Planning Committee worked with The Roxy Theatre ManagerMaria Canton (CFUW member) to book dates for the performances as well as a couple of tech/dress rehearsal dates at The Roxy. Promotion of the co-pro was coordinated by Roxy Theatre Manager Maria Canton and Producer Judy Beth Armstrong (OSLT/CFUW member). Ticket sales were handled by The Roxy Box Office, in person, by phone or online – and sales were encouraged at every CFUW meeting and among our neighbouring CFUW clubs. Ticket sales in the first two years averaged about 200 in a 400-seat theatre. Thankful for the 50-50 co-production split with The Roxy Theatre, our club cleared an average of $1200. in each of those two years. And those earnings certainly helped to top up our scholarship fund! Our CFUW club skipped a year of “The Carol” as we devoted our energies to hosting a regional CFUW event, and also decided that we didn’t want “The Carol” to wear thin. Then in May of 2018, we entered into another co-production agreement with The Roxy Theatre for a December 2018 performance and embraced a new-to-the-Carol but well-experiencedOSLT Director, Pat O’Connor. By August, Pat had re-written and adapted the CBC “dramatic readings” script as a stage play, A Dramatization of Charles Dickens’ A Christmas Carol, effectively utilizing a narrator while setting out scenes in each Stave where no fewer than 26 actors speak their lines, sing, dance, use props and wear vintage costumes from theOSLT wardrobe. The play was cast, production team assembled and rehearsals for this one-night-only show began in late August. At this writing, the 400-seat theatre is sold out and as a result, CFUW – OS hopes to realize about $2500 for our scholarship fund and other community outreach projects. Having successfully presented the dramatized, heartwarming tale of A Christmas Carol three times now for Owen Sound audiences, our Club is delighted that we’re spreading the word aboutCFUW and our scholarship fund, and attracting new members – while providing our audience with an evening of high caliber entertainment, music, and reflection as we embrace the Christmas season.